UN, September 14. /TASS/. 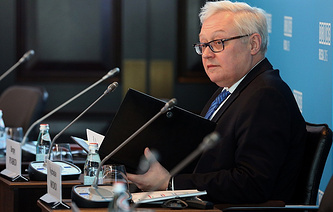 Participants of the nuclear deal with Iran (Russia, China, the United Kingdom, France, Germany and Iran) will hold a ministerial meeting on September 24 on the sidelines of the UN General Assembly in New York, a diplomatic source in the organization told TASS. "The meeting was scheduled for September 24," the source said. "It will also be attended by the European Union foreign policy chief, Federica Mogherini." The sides are expected to discuss ways to preserve the nuclear deal after US unilateral withdrawal and the reintroduction of US sanctions against Iran. On May 8, US President Donald Trump announced Washington’s withdrawal from the deal. He said that old sanctions on Iran would be restored and new ones would be introduced in case Tehran attempted to pursue its nuclear ambitions. The first batch of new US sanctions on Iran took effect on August 7. Earlier, US Ambassador to UN Nikki Haley announced that would convene a high-level Security Council meeting on Iran on September 26 with an aim to draw attention to Tehran’s alleged violation of the international law. She added that the US leader would personally chair the meeting.